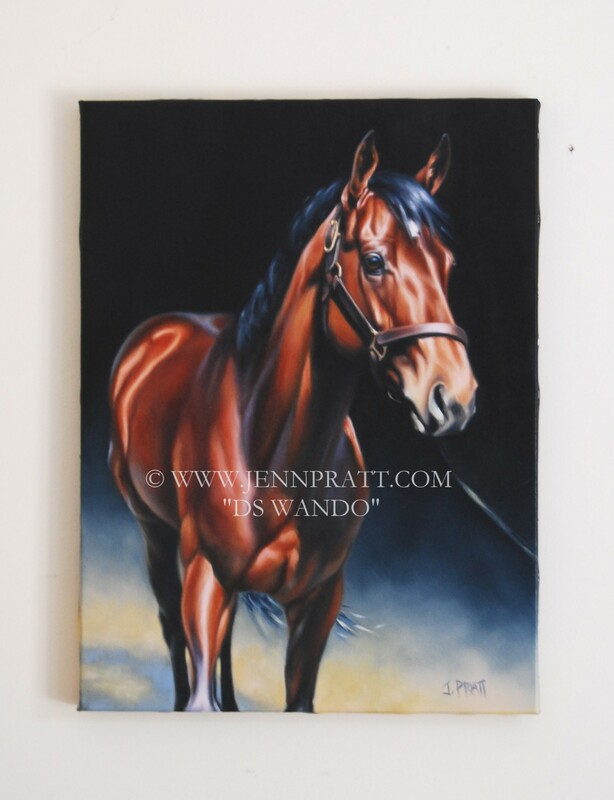 Thoroughbred D’s Wando, from Start to Finish Line | Jennifer Pratt Equine Artist. The majority of my commission subjects to date have mainly been Sporthorses; horses bred for the English disciplines of Hunter, Jumper and/or Dressage. They typically but not always, are warmbloods and have similar conformation which makes them competitive in their selected sport. Completing my first thoroughbred painting of an actively racing subject named D’s Wando, was a change of pace – quite literally! Feeling I wanted something a bit more dramatic to present to my client, I kept going with two more studies. Now things were really cooking in the studio. I felt that the last two studies were the strongest. The last one, had potential to be a unique pose and perhaps a bit more dynamic. I imagined he could walk right off the canvas, into the viewers space. We went with this last one and I was very happy about this choice! The final painting, 18×24 took about two months to complete. I’m happy to say, he’s headed for home tomorrow, to a very happy owner 🙂 Here is the final painting hanging on my studio wall to dry. Beautiful! Well done. Love the looser studies too. thanks Jen! i’m partial to the study of the full body from the front with his head to the side. The client owns that one now. I had fun with those last two studies the most!